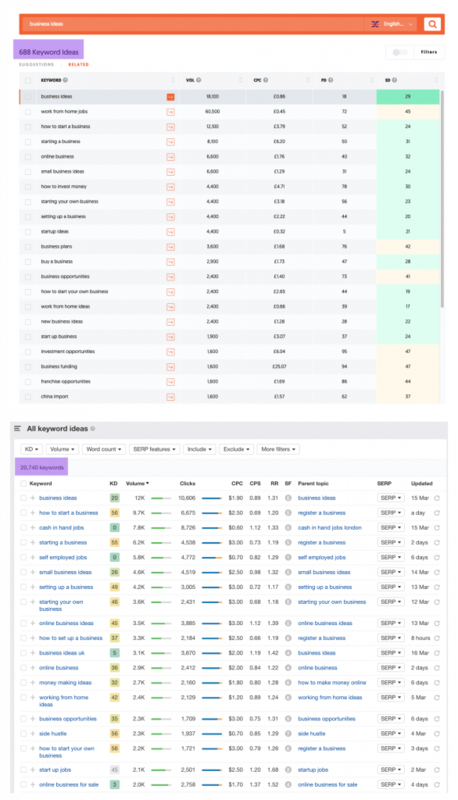 This is a comparison of 2 keyword research tools; Ubersuggest versus Ahrefs. 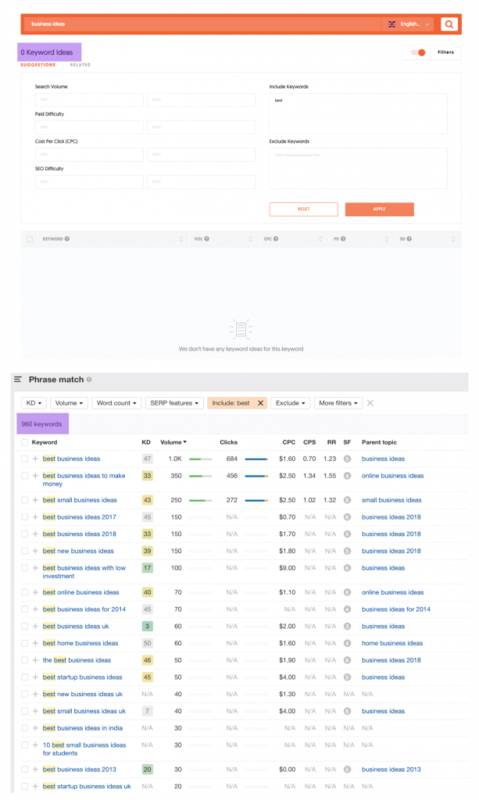 Ubersuggest is a free keyword research tool whereas Ahrefs is a premium, paid for tool. I’ve noticed that a few of my connections have liked LinkedIn posts about UberSuggest I’ve published. So I wanted to compare and contrast the information both tools deliver. First up, I compared the top pages traffic. This screenshot compares the top page traffic of my website from Ubersuggest and Ahrefs. 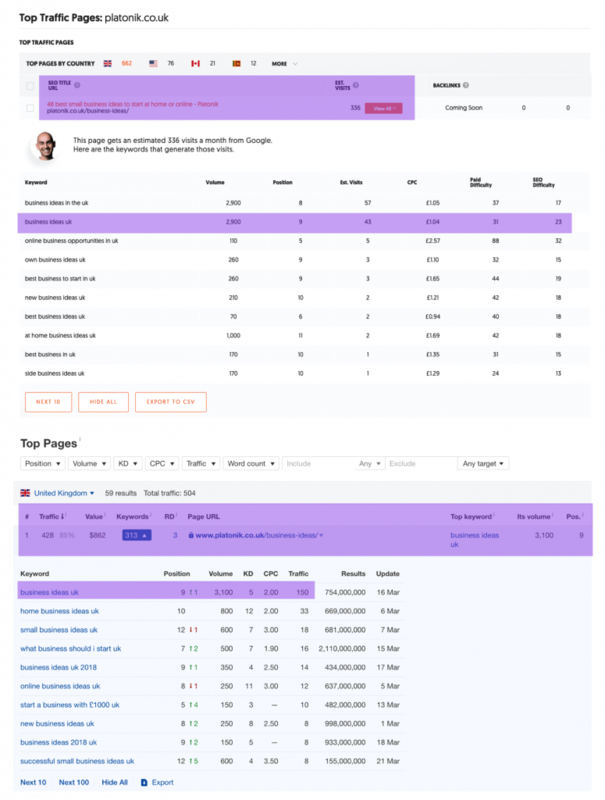 When I compared my top page with both keyword research tools they produced fairly similar results. Ahrefs estimates I get more traffic whilst Ubersuggest tells me that my page ranks for more keywords. Bear in mind both tools are estimates. In reality my pages gets over 1,000 organic visits per month and ranks for 2572 keywords. But the traffic estimates for the top ranking keyword, business ideas uk, varies massively. Search volume and keyword position are almost identical. The keyword difficulty scores are similar; although I don’t know how Ubersuggest calculate difficulty. Ahrefs’s keyword difficulty score of 20 means you need around 20 links to your page to rank on page 1. Keyword difficulty of 20 is really hard for a new website. I actually have 3 links to my page; Ubersuggest don’t report page backlinks. So as a measurement of difficulty it goes to show you can rank for harder keywords with a smaller number of links that Ahrefs predicted. If I only needed a tool to estimate top page traffic I’d say Ubersuggest is a useful tool to have at your disposal. 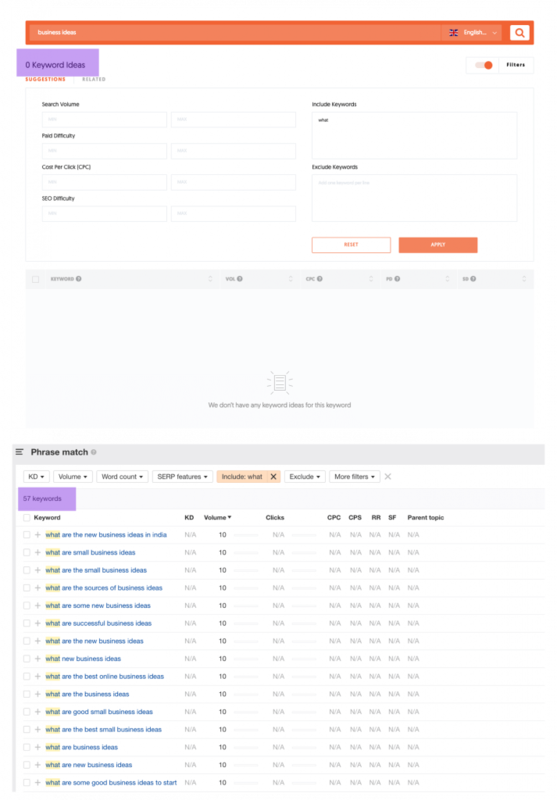 Next, I wanted to compare their keyword research tool. I used the same seed keyword as above; business ideas for Google UK searches. 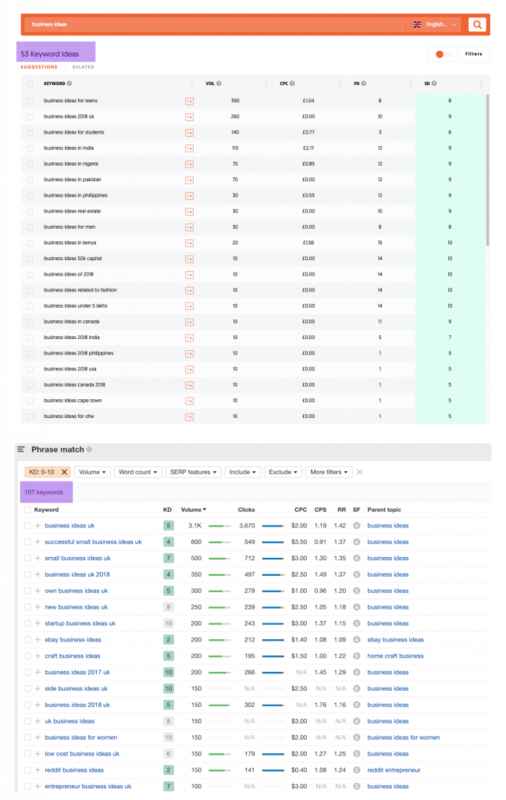 I have highlighted the main keyword research data from both tools for my seed keyword. The search volume varies considerably. In terms of difficulty, Ubersuggest state this keyword is easy but Ahrefs say it’s medium difficulty; needing 22 links to the page to rank on page 1. I’d say this keyword and topic is hard to rank for. 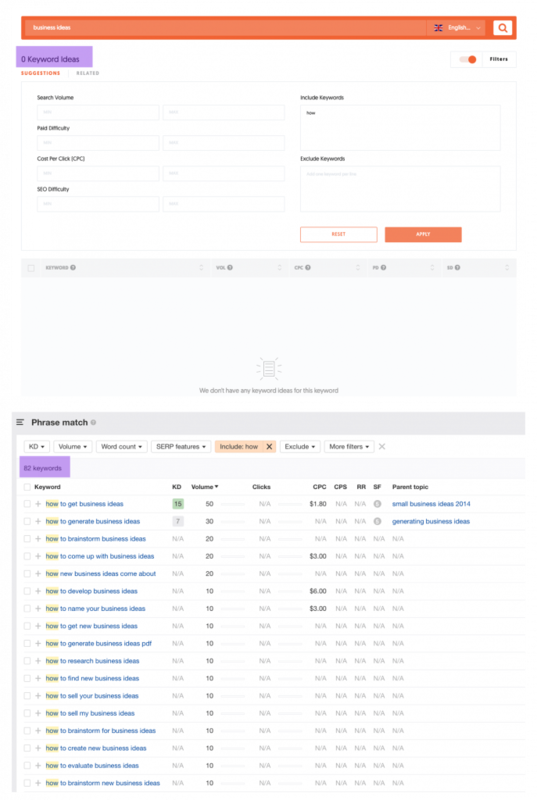 Ahrefs deliver additional data about this seed keyword. Ahrefs tell you clicks to the top pages for this keyword. They tell you what percentage of clicks come from organic search results. They tell you the percentage of times that result was clicked. And Ahrefs tell you the RR, the return rate, how often people come back and made that search again the same month. This data is important to know. You could, for example, pick a keyword with high search volume and low difficulty. Then it turns out hardly anyone clicks the results and those that do only click from paid results. Basing your strategy on half the information could set you up for disappointing and failure. So the feature comparison between the tools is beginning to widen. Now, what about the number of keyword ideas each tool can generate ? Next I wanted to discover how many keyword ideas related to the seed keyword each tool delivered. Each tool shows 2 types of keyword ideas; same as keywords and all keyword ideas. Same as or same term keywords are those keywords that contain the same phrase. So with Ubersuggest, I’m shown 146 same as keyword suggestions compared to 17673 same as keywords from Ahrefs. Just look at the screenshot above to see the ideas that Ahrefs deliver. It appears that Ubersuggest is mainly delivering longer tail variations of the seed keyword and not looking for words before the seed terms. Next, I looked at all keyword ideas; maybe some of the keywords you need from Ubersuggest are stored under the related keywords tab. Yes you need to look under related keywords in Ubersuggest to find some of the keyword ideas Ahrefs show as same as keywords. But when I compared all the keyword ideas for Ubersuggest and Ahrefs, there’s still a vast gap between 688 and 20,740 keywords. So when it comes to keywords ideas, as Gary V would say, Ahrefs is crushing it. Another essential part of keyword research is the ability to filter keywords by words, phrases or difficulty. Filtering keywords is useful when understanding the users’ intent. If we take this post for example, it’s called Ubersuggest versus Ahrefs : a keyword research comparison. I know most of my target market use free research tools like Google Planner and Ubersuggest. I know I can deliver them better rankings and traffic results for their clients by using paid research tools than free tools in my Mini SEO Plans. There are 4 types of searches. That’s where keyword filtering is so critical. In this exercise I chose to filter the seed keyword, business ideas, by queries containing “online”, “small”, “how”, “what” and “best” to discover how many keywords each tool delivered. Then I chose to filter by keyword difficulty to discover how many keywords were returned. Here’s a screenshot comparing the number of keywords when you filter the seed keyword by the word “online”. Ubersuggest have 2 keyword ideas that contain “online” where as Ahrefs have 709 keyword ideas. Here’s a screenshot comparing the number of keywords when you filter the seed keyword by the word “small”. Ubersuggest have 1 keyword idea that contains “small” where Ahrefs have 1932 keywords. Here’s a screenshot comparing the number of keywords when you filter the seed keyword by the word “how”. Ubersuggest don’t have any keyword ideas that include “how” whereas Ahrefs have 82 keywords. Whilst the search volume of these 82 keywords is really small, 50 searches a month, finding small volume keywords and ranking them on page 1 can still deliver good traffic for a brand new website. Here’s a screenshot comparing the number of keywords when you filter the seed keyword by the word “what”. Again, Ubersuggest fails to deliver any keyword ideas for my seed keyword that includes “what”. However Ahrefs gives me 57 long tail, small volume keyword ideas. Here’s a screenshot comparing the number of keywords when you filter the seed keyword by the word “best”. Ubersuggest don’t deliver any keyword ideas whereas Ahrefs give 960 keywords ideas. Now let’s filter by keyword difficulty. Filtering keyword ideas by difficulty is a popular strategy of many web professionals. For newer or less authoritative websites we tend to avoid the hard to rank topics and keywords. Here’s a screenshot comparing the number of keywords when you filter the keyword difficulty from 0-30. In this example, Ubersuggest is better at delivering keyword ideas when you filter your seed keyword by difficulty than a word. As you can see from above 142 keyword ideas from Ubersuggest and 202 from Ahrefs. Now, here’s a screenshot comparing the number of keywords when you filter the keyword difficulty from 0-10. Ahrefs have twice as many keyword ideas when you filter by very low keyword difficulty. So to summarise here’s a tool comparison when applying 7 different keyword modifier filters. 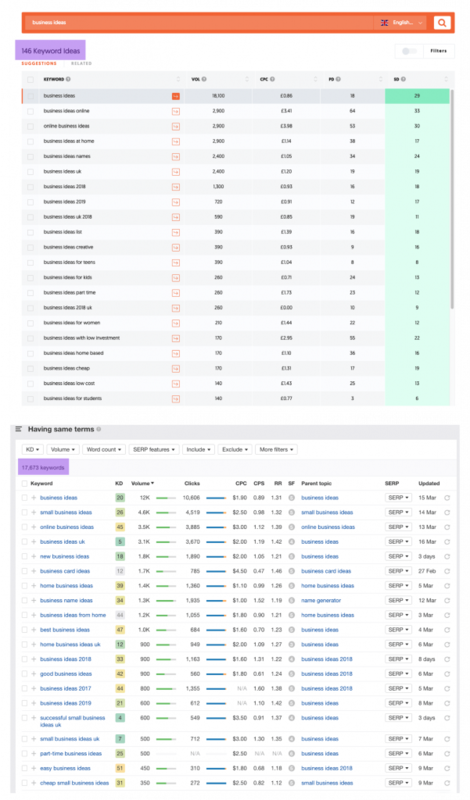 The next comparison was to look at how each keyword research tool estimates the traffic to the top 10 pages. In this day and age of featured snippets and Google scraping questions and answers, it is essential we know the keywords and topics we research can realistically earn traffic. Each tool delivers different pages in different positions and provides different page traffic estimates. From the table and screenshot below, it appears Ubersuggest are using a proportional ranking method to determine traffic to pages in position 1 to 10.
ie: position 1 result gets x% of traffic, position 2 result gets y% of traffic. Notice that with Ahrefs estimated traffic, the result in position 10 is greater than the results in position 7,8 and 9. And traffic to the page in position 12 is greater than the pages in position 7,8,9,10 and 11. 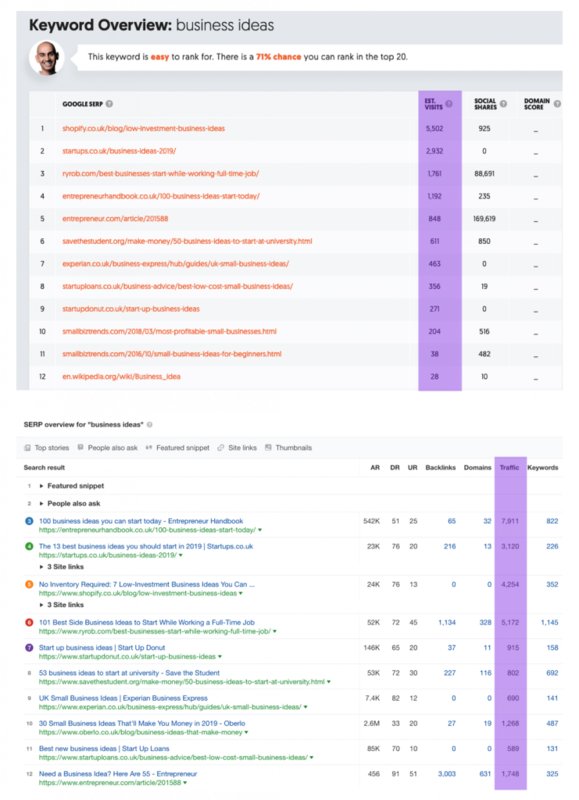 If you look at the Ahrefs data in the below screenshot you can see they show the number of keywords and traffic for each page. Let’s compare the traffic estimates to each top page regardless of their position. Some of these traffic estimates vary wildly. So I decided to use Ubersuggest to check the top pages traffic for the Shopify and Startups pages. Above, Ubersuggest tells me the Shopify page gets 5502 visits but the top pages result tells me the exact same page gets 8997 visits. The Startups page above gets 2932 according to Ubersuggest but the same page in the top pages report gives 4521. Here’s a list of features that Ahrefs contain and Ubersuggest don’t have. I’ll explain how they are beneficial to doing keyword research. Ubersuggest is a very welcomed and useful addition to the keyword research market. However there are features Ahrefs have in their toolkit that Ubersuggest don’t have. 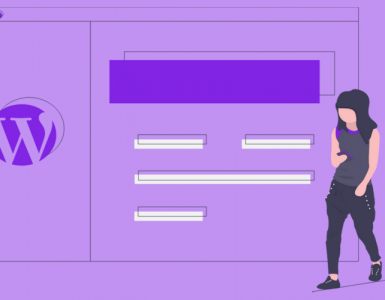 Ubersuggest are only pulling data for Google searches whereas Ahrefs have expanded their keyword research tool to include other search engines. It is said that more people start their product research on Amazon than any other website. 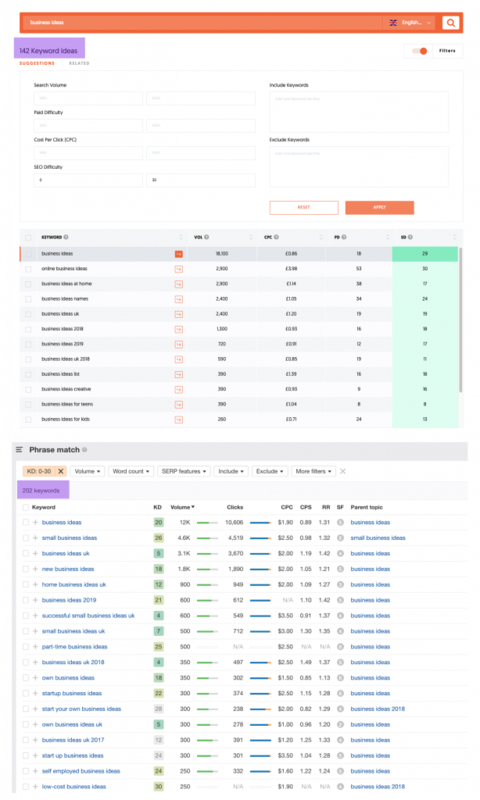 So adding in an Amazon keyword research tool is a great addition for e-commerce agencies and clients. 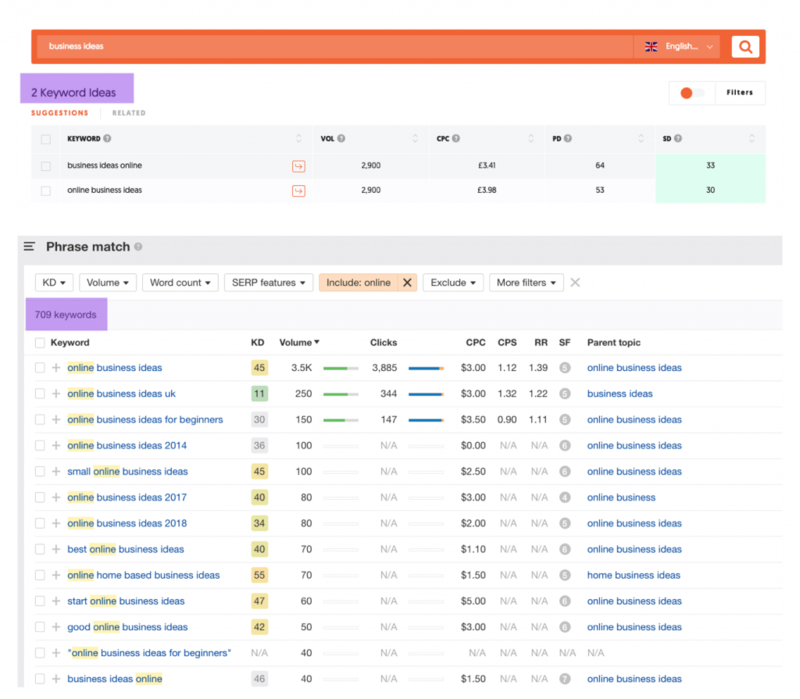 I use Amazon keyword research in conjunction with the sales data estimates from Jungle Scout to provide both research and sales data for those looking to source and sell products. Whilst there are YouTube keyword research tools such as VidIQ and TubeBuddy, we can now do YouTube keyword research inside Ahrefs. Whilst Bing has such a low share of the market it’s neglected by most online marketers. So perhaps with a Bing keyword research tool you can become a big fish in a small pond. Same goes with Yahoo; I never hear marketers discuss Yahoo search results but good to know I can research here. There are various other international search engines that Ahrefs provide keyword research data for. Useful for others but not for my needs. For every search result, Ahrefs will show you the search history and volatility of the top 10 results. If you see trend lines where the top pages are fairly level you probably want to omit targeting those keywords. But if the lines are up and down like a yoyo then Google may not be able to figure out the best results to rank or what the user wants. Ahrefs kill it with their competing domains feature. I can find out the traffic the top competitors get in seconds. And targeting your top 20 competitors ranked pages is one of the best keyword research strategies. Doing this with Ubersuggest would take hours and days. Pop in your website and look at competing pages means you can see what keywords other rank for you that you don’t. This might result in improving your page content. A strategy that’s worked wonders for my website and some clients. This report shows you the pages on a website that have the most backlinks. 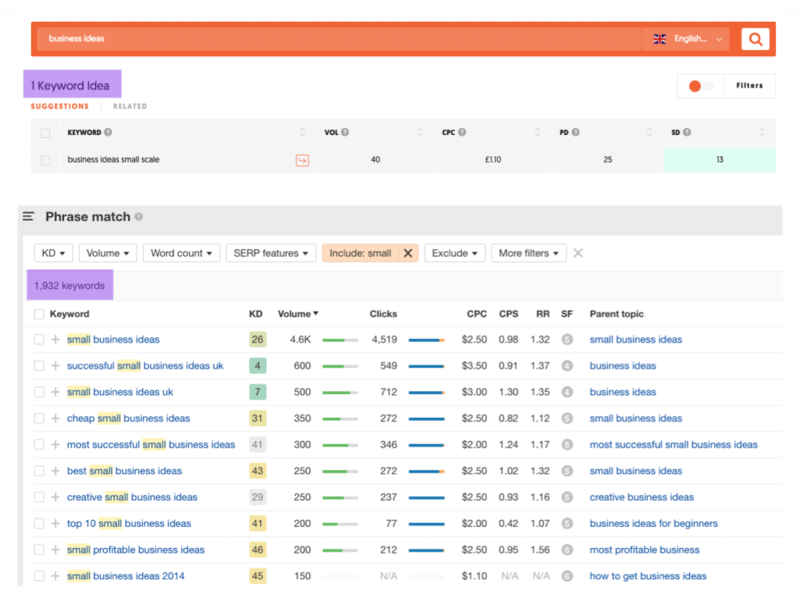 Where this is useful is reverse engineering your competitors link building strategy. For example, I found a client’s competitor got links to infographics and pages they created about hot places and temperatures. And I found out a recruitment client’s competitor got most of their best links by targeting schools with job seekers resource pages. Plug in your website and a few competitor or industry website to see the content they rank for that you don’t. Ahrefs will show the internal links to each of your pages. This is useful when you want to boost the links and rankings of this pages that have a few or no internal links. Here’s my course on advanced internal link building. If you do a lot of link building this data is helpful to track new links. Alternatively if you are losing links this helps to convince clients they need to check their pag content or start a new campaign or recover lost links. Another keyword research strategy for advanced uses is to identify the traffic to pages that link to you or industry websites. Similar to the referring domains report. You can check broken links to competitors or industry websites; ideal for a broken link campaign. Check your website does not have broken or 404 pages as a result of a site audit or content restructure. You can analyse the links your competitors have that you don’t have and seek out these links. Quickly compare the links, traffic and domain rating of lots of similar websites. With the Ahrefs site audit tool you can identify hundreds of website issues and fix them. 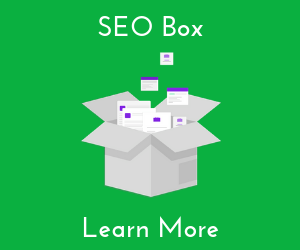 I have a training course on doing a site audit; all part of SEO Box membership. 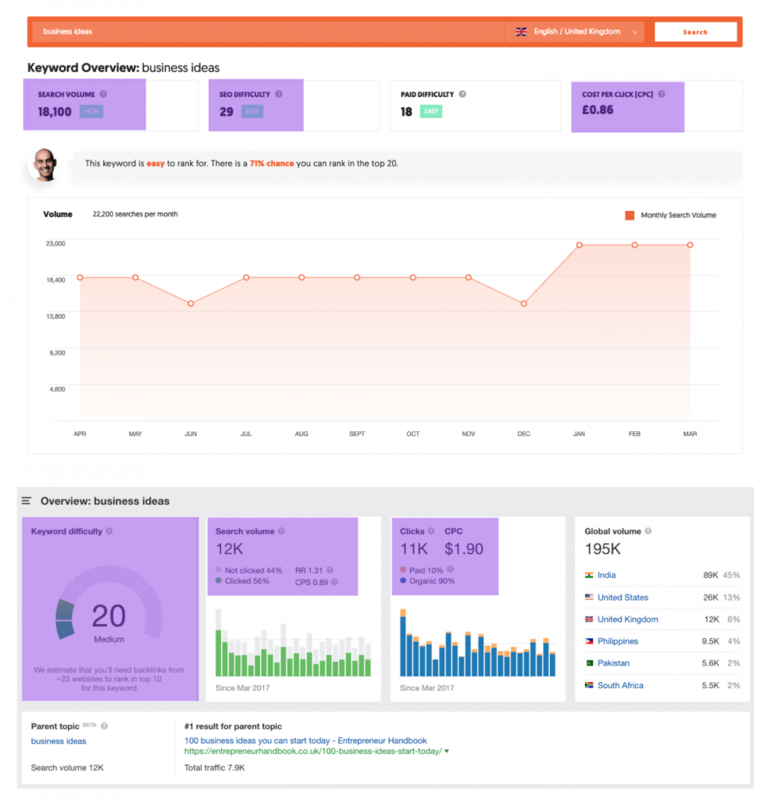 Track the positions of your pages, keywords and competitors with the site audit tool. With content explorer you can discover all kinds of data of pages in the Ahrefs index going back years. You can find pages that earns shares by various social channels, page traffic and referring domains and word count. My best link building strategy is broken link building. Enter a seed keyword and filter by broken links then sort by referring domains. Suddenly you have hundreds of link prospects to reach out to and propose your page as an alternative resource. And yes I teach broken link building inside SEO Box. 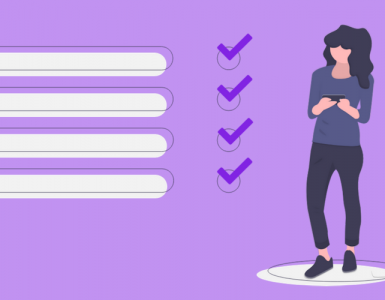 Without doubt Ubersuggest is a useful keyword research tool. But in the words of Sean Connery in The Untouchables movie it’s like bringing a knife to a gunfight. If it was a boxing match between Ubersuggest and Ahrefs the contest would be over with the second punch. Win by knock out; Ahrefs. Competition for a place in Google’s top 10 search results is a battle. So new or emerging websites need the tools to compete with their stronger, better ranked competitors. You need to right tools to compete and that’s why Ahrefs is your go to keyword research tool.